Claude, Monet. "Manet Painting in Monet's Garden in Argenteuil." Digital image. Wikipedia Commons. Accessed August 21, 2010. http://commons.wikimedia.org/wiki/File:Claude_Monet_-_Manet_malt_im_Garten_Monets_in_Argenteuil.jpg. Cloth of Gold: Displayed Falcons. Mid-13th C. Cleveland Museum of Art, Cleveland, OH. Cloth of Gold: Winged Lions & Griffins. Mid-13th C. Cleveland Museum of Art, Cleveland, OH. Cloth of Gold with Rabbit Wheels. Mid-13th C. Cleveland Museum of Art, Cleveland, OH. Duchamp, Marcel. "Fountain." Digital image. Wikipedia Commons. Accessed August 21, 2010. http://commons.wikimedia.org/wiki/File:Duchamp_Fountaine.jpg. Dupree, Nancy. 49-24. Dupree Collection, Williams Afghan Media Project, Williams College, Williamstown, MA. Dupree, Nancy. 51-100. Dupree Collection, Williams Afghan Media Project, Williams College, Williamstown, MA. "Folio from a Shahnama (Book of Kings) by Firdawsi (d. 1020); Verso: Siyavush Hunts with Afrasiyab." Digital image. Freer Gallery of Art / Arthur M. Sackler Gallery. Accessed August 21, 2010. http://www.asia.si.edu/collections/zoomObject.cfm?ObjectId=49360. Katsushika, Hokusai. "The Great Wave off Kanagawa." Digital image. Wikipedia Commons. Accessed August 21, 2010. http://commons.wikimedia.org/wiki/File:Great_Wave_off_Kanagawa2.jpg. Naim, Mohammad. Mohammad Naim of Qandahar, Tirin Hotel. Recorded 1966. Hiromi Lorraine Sakata, Cassette. "Portrait of Alexei Grigorievich Bobrinsky in a Masquerade Costume (1762-1813)." Digital image. Wikipedia Commons. Accessed August 21, 2010. http://commons.wikimedia.org/wiki/File:Alexei_borinsky.jpeg. Revuelta, Sueiras. "Eduardo Chillida's Eulogy to the Horizon." Digital image. Wikipedia Commons. Accessed August 21, 2010. http://commons.wikimedia.org/wiki/File:Elogio_chillida_gijon.jpg. "The Saint-Josse Shroud." Digital image. Le Louvre. Accessed August 21, 2010. http://tinyurl.com/2uktxto. "Textile, Coptic." Digital image. The British Museum. Accessed August 21, 2010. http://bit.ly/d3vBWd. "Turkmen Braid Jewerly." Digital image. Virtual Collection of Masterpieces. Asia and Pacific Museum in Warsaw. Accessed August 21, 2010. http://masterpieces.asemus.museum/masterpieces.aspx. Van Gogh, Vincent. "The Starry Night." Digital image. December 4, 2004. Accessed August 21, 2010. http://en.wikipedia.org/wiki/File:VanGogh-starry_night.jpg. "The Vaso Vescovali." Digital image. The British Museum. Accessed August 21, 2010. http://bit.ly/9Uo7zs. Warot, Mike. Flamingo. April 1, 2009. Chicago. Accessed August 21, 2010. http://www.flickr.com/photos/--mike--/3406365098/. And what makes it valuable? Is it defined by beauty? Masterful technique? Rarity? How do we know art when we see it? Most of what we consider art from Afghanistan is very different from what we consider art in the West. There is no tradition of independent painting and sculpture, which is our major art form from the West. Instead, what we think of as art are everyday objects that are of a finer quality but still functional. The importance of art is that it tells us about different kinds of society than texts. Texts tend to be written by the literate, the upper classes, the learned classes, men – and they reflect those views. Art is made for a wider variety of people, particularly day to day art. And much of what we talk about from medieval Afghanistan is day to day art, things that were functional objects, just nice examples of them. Weaving, embroidery, and other textile traditions are some of the most important art forms in Central Asia. 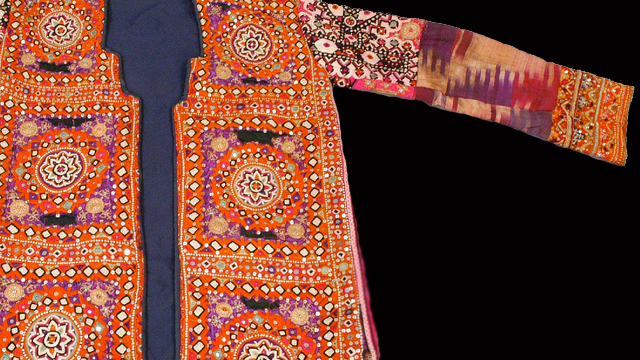 Textiles define space inside the home and they define who people are – such as their ethnicity, rank, or occupation. But despite their importance – or perhaps precisely because of their importance – historical textiles are rarely preserved and found. One of the most famous textiles from the Samanid period was preserved as a shroud in an abbey in northern France. It has an inscription at the bottom that said it was made for an emir. And we know from historical sources that he was an army commander in central Asia, and that he was put to death in 962. And he commanded troops in what is now the province of Khor– or what is the province of Khorasan, which comprises now eastern Iran and western Afghanistan. The textile is superb. It shows two elephants, a ring of camels, and an inscription at the bottom asking for blessings on this commander, Abu Mansur Bukhtegin. Since it asks for blessings, we know he’s still alive. And since he died in 962 according to the texts, we know it must have been made before he died. So it provides a very, very rare example of a datable textile. Although historians may be able to pinpoint where and when an artifact or handicraft was made, it’s purpose is much harder to determine. It’s an extraordinarily complex weave, and we can’t imagine that only one was woven. We have to imagine that there were hundreds of these textiles, all with the man’s name on it. Did he use them on his troops? Did he hang them around his palace? We have no idea. But they’re quite extraordinary, both for its state of preservation and for its iconography, it’s – what it shows on it. Because Afghanistan was so rich in metals, decorative metalwork like jewelry was also an important part of the craft tradition, as were metal objects used for bathing, cooking, and transporting food and drink. One of the most famous of these is the Bobrinsky Bucket, which is named after the Russian Count Bobrinsky, who found it. it is probably the most famous piece of metalwork from Afghanistan because it actually says that it was made in Herat. It gives the date, which corresponds to 1163. It gives the name of the patron, or owner, who was a merchant. And it also gives the name of the workman who made it. It’s extraordinary in technique. It has bands that show different kinds of scenes of princely life – hunting, feasting and backgammon. It has all kinds of writing on it, hence all the information we know about it – writing that includes interlacing; writing that includes human figures, where actually the letters grow into human heads. We just don’t know what it was for. We know what it wasn’t for. It can’t be used for cooking – it’s too fancy. It can’t be used for holding milk, as a milk bucket, because milk curdles with copper. The only functional purpose we can imagine is that it was used as a bath bucket, when you filled it with water and poured water over yourself in the traditional Turkish bath. And we actually have later paintings from the 15th century showing plain versions of this kind of bucket. But why you would want a bath bucket covered with wonderful scenes and all kinds of writing, is very unclear. One of the problems is that we don’t know whether the Bobrinsky Bucket is unique, or typical. It survived. Did it survive just because it was buried? Or did it survive because people made hundreds of them and this is just one example. So we have to be very careful about how we generalize from our single examples. Although artifacts that are unique and well-preserved can be a treasure trove of new information, their importance can be exaggerated because of their rarity and beauty. Maybe that’s because today we see art in something that was once only an everyday object. What is art? Is it defined by beauty or by rarity? What makes it valuable?